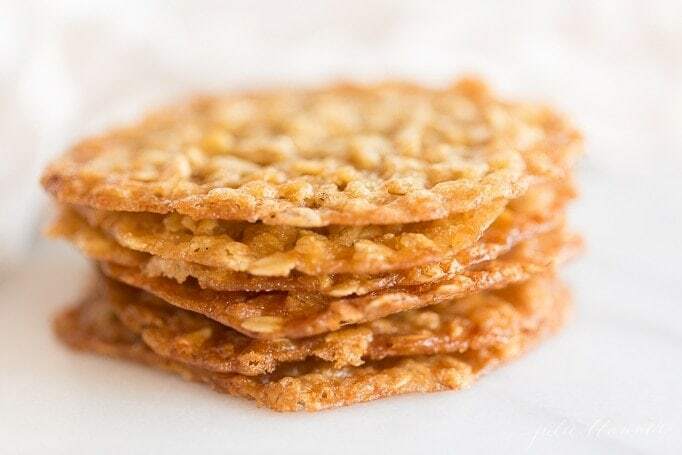 Oatmeal Lace Cookies are a thin, chewy oatmeal cookie with a deliciously sugary taste, that are stackable for easy gifting. 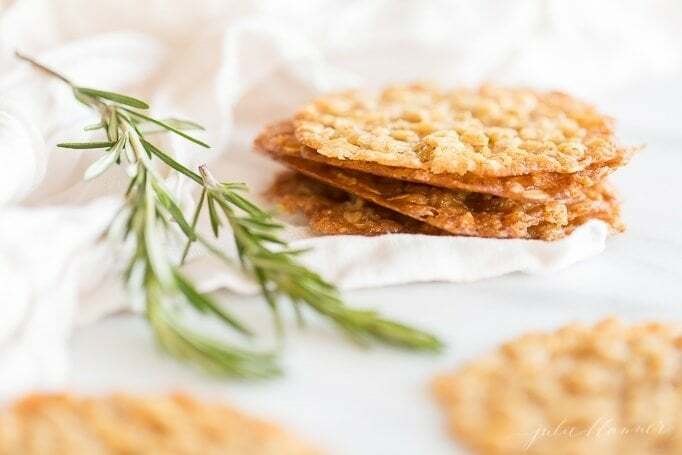 Lace Cookies are made with just 7 staple ingredients and are so quick and easy to make! 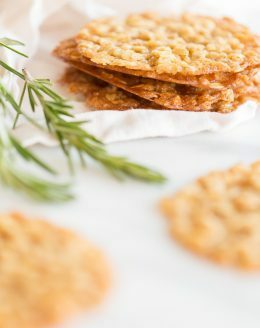 I’m not typically a fan of oatmeal, but the brown sugary, chewy texture of these Lace Cookies is out of this world – and addicting! If you loved my popular Better than Pecan Pie Cookies, I know you’ll be a fan of these lace cookies. 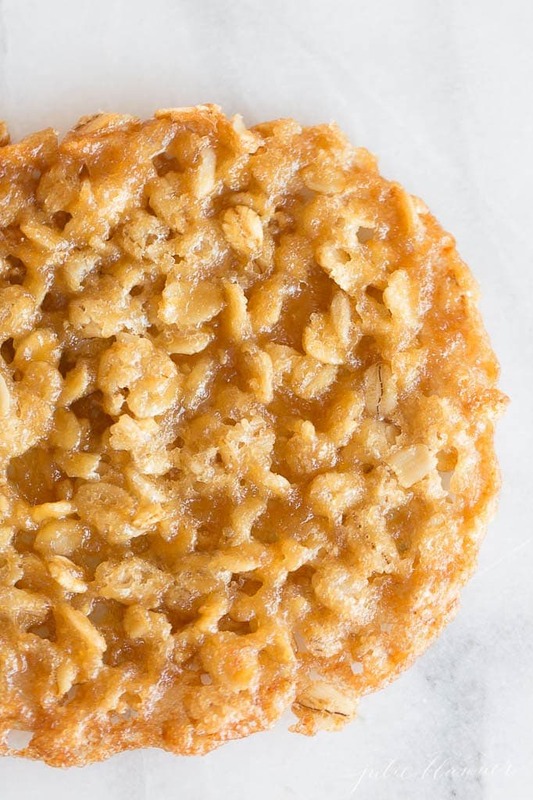 What Are Oatmeal Lace Cookies? 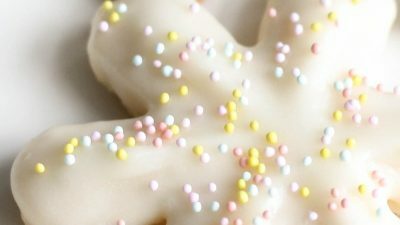 Lace cookies are named after their lacey appearance they receive when the sugar bubbles and creates tiny little gaps. 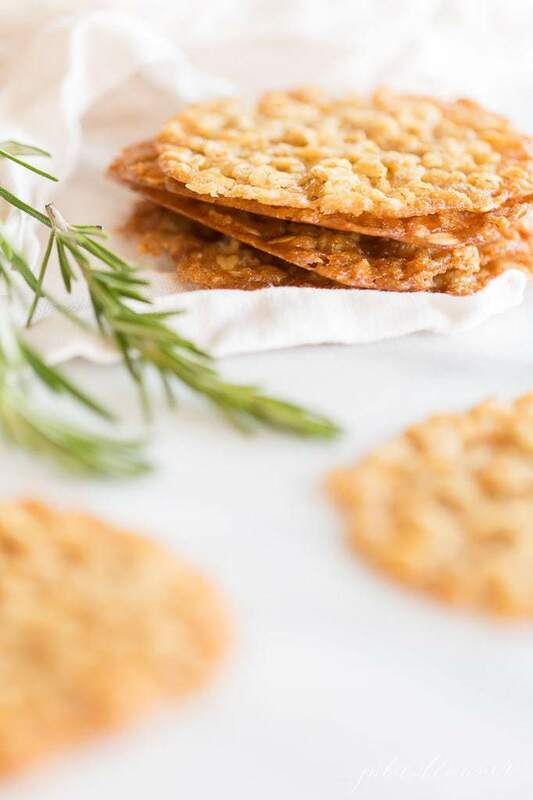 Oatmeal lace cookies are dropped onto a lined cookie sheet by teaspoonful or with a cookie scoop and as they bake, they become flat, giving them their thin, chewy body. 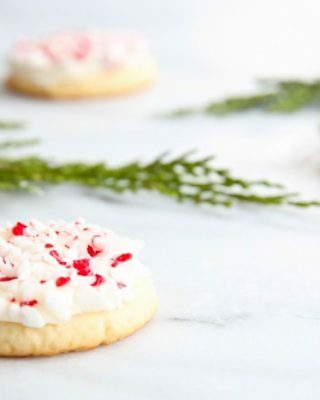 They’re one of my favorite Christmas cookie recipes. They’re the perfect cookie to bring to a cookie exchange. You can even stack them in a cellophane bag and tie with a ribbon to gift to friends, family, neighbors and coworkers! 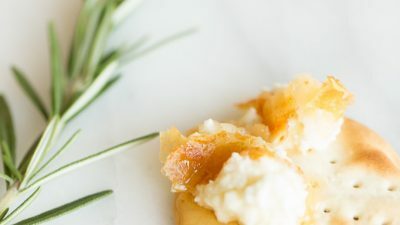 They’re incredibly fast and easy to make in just one dish. A pot, in fact! No need to soften the butter when you’ll be browning it to perfection to caramelize the brown sugar. Brown butter in a saucepan until it turns brown in color and nutty in aroma. Remove from heat and mix in brown sugar, oats, vanilla and egg. Drop onto parchment lined cookie sheets and bake. 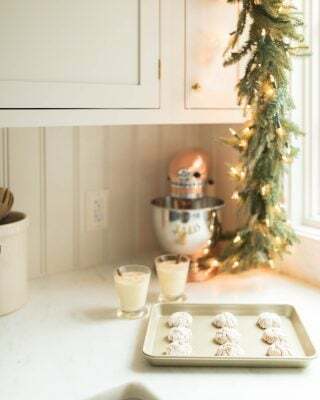 You can get the printable Oatmeal Lace Cookies recipe below! 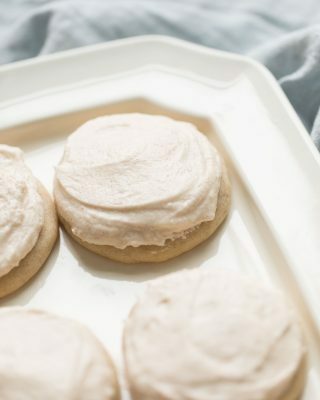 If you make these Lace Cookies, please leave a 5 star review in the comments below, I love hearing from you! In a saucepan over medium heat, brown butter until it turns brown in color and nutty in aroma. Remove from heat. Mix in brown sugar, oats, vanilla and egg. Using a cookie scoop, drop onto a parchment lined cookie sheet leaving ample room to spread. Bake 6 minutes or until golden brown. 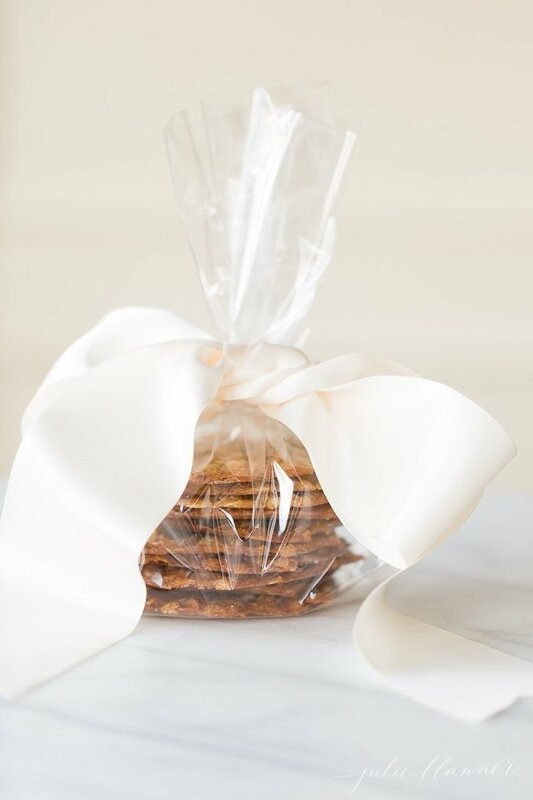 Stack in cellophane favor bags and tie with a ribbon for a beautiful Christmas gift for friends, family, coworkers, neighbors and more! I’m excited to join several of the friends I vacationed with over the summer to share some of our favorite sweet Christmas treats with you today. As you may recall, we met in Round Top, Texas for a weekend of fun and fellowship. Please take a moment to pursue all the sweet treats we made for! These look delicious Julie! Such a pretty cookie. Lovely! I love your understated style. These are the classiest cookies ever! LOVE that packaging! From the queen of class herself! These look so pretty and sound just amazing! I love them packaged up as a gift – so sweet! We look forward to these sweet, crunchy cookies every Christmas! A family favorite! Much tougher recipe than anticipated. Brown sugar still seems a little grainy and cookies seem greasy. Also worth noting is they need to set on the cookie sheet for a few before you remove them. I was really looking forward to these and while the flavor is good they sit heavy after eating. 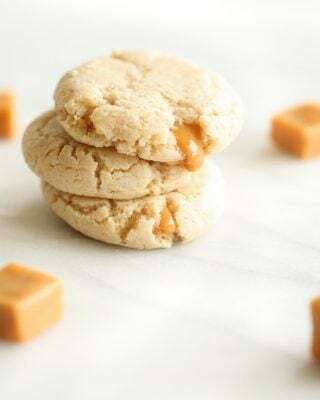 Loved making this recipe and it really brought me back to childhood! I substituted smoked sea salt and deglazed my butter browning dish with a tablespoon of whiskey for a little hint of adult flavors. So good! Sounds like a delicious twist – I can’t wait to try!